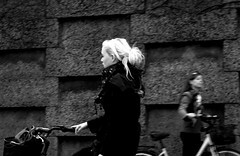 One of the more subtle details of the casualness of Copenhagen bike culture is one that I never noticed until recently. 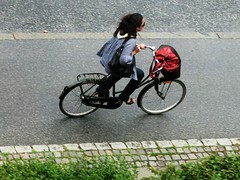 The sight of a cyclist riding with one hand is truly a sign that urban cycling is relaxing and refreshing. You're at ease on the bike lanes, separated from the traffic. Your only concern is maintaining a comfortable momentum on your way to wherever it is you are going. One finger riding is even better. Also, how fabulous are those red gloves in the first photo? Very. Jennifer... in a way it's not the motorists fault... they just need to get used to it. the most cyclists on the roads, the better. safety in numbers. and the glove is rather fantastic. One hand off the bike! Now that's just being stupid. It's like walking without a cane! Thanks to this blog, I am now going to work on my bike, which takes about an hour each way. I'm usually just a tiny bit behind schedule, so, I'm afraid I can't be quite that relaxed in my pace... And how do they keep their skirts from flying up in their faces? I ride along the edge of a river, and the wind is always blowing, it seems. So, I change from slacks to a skirt when I get to work. I do wear a helmet, because it's required by law, except last Sunday, I didn't because I figured there wouldn't be any police looking for law breaking church goers! It felt lovely and free. 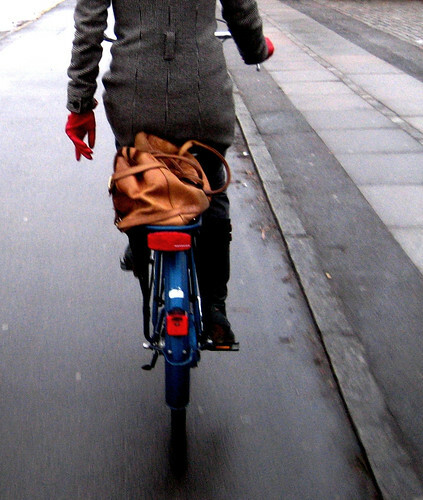 I ride a funny looking bike (Townie) and it's fun to watch how many people pass me at a great pace, only for me to pass them again a few minutes later, and never see them again, because I can keep on quite steadily and smoothly and they can't do it on their sporty bikes! That sounds lovely, Wilma. So pleased to hear it.